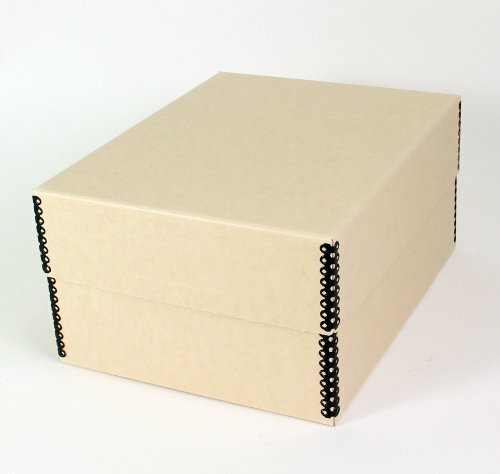 Often called 'Archival Shoe Boxes' this style box is a general purpose container for safely storing and protecting post cards and photographic prints. They are also commonly used for storage of small specimens such as mineral samples. Our short top boxes have removable, close-fitted tops to seal out dust and insects. Embossed labeling areas on box end and lid front neatly, accurately and consistently locate and position standard pressure-sensitive (PSA) identification label. Short top boxes are manufactured from .040, and .060 tan-finished, acid- and lignin-free ArchivalGradeª boxboard. Metal edge clamps are corrosion treated in black polyester coating with wax-free polyester on the blind side. These clamps provide rigidity and high stacking strength. Size: 10.5" x 8.2" x 5.2"
Manufactured from .040, and .060 tan-finished, acid- and lignin-free ArchivalGrade boxboard. If you have any questions about this product by Archival Boxes, contact us by completing and submitting the form below. If you are looking for a specif part number, please include it with your message. Logan Electric Slide File, Archival Metal Storage Box Holds 750 2x2 Mounted Slides in Groups of 25 in Styrene Inserts.